If you had told me two and a half years ago that I would be writing a review on a pair of snowshoes, I probably would have laughed in your face. We got snow in Virginia, and sometimes we got a lot of it (ask me about the AP History paper I had due in February of my Junior year), but there was never a reason for me to own snowshoes. I'd throw on a pair of boots (sometimes insulated, most of the time not), a pair of snow pants, and run outside with an inner tube to sled down my hill until I couldn't feel my toes. There weren't frozen lakes or several feet of snow packed down or any reason to use something on my feet other than those old boots. When we moved to Colorado, though, that all changed. The lake at the State Park by our first apartment would freeze in November or December and stay frozen through March or April. Bear Lake in RMNP would have 46" of snow. 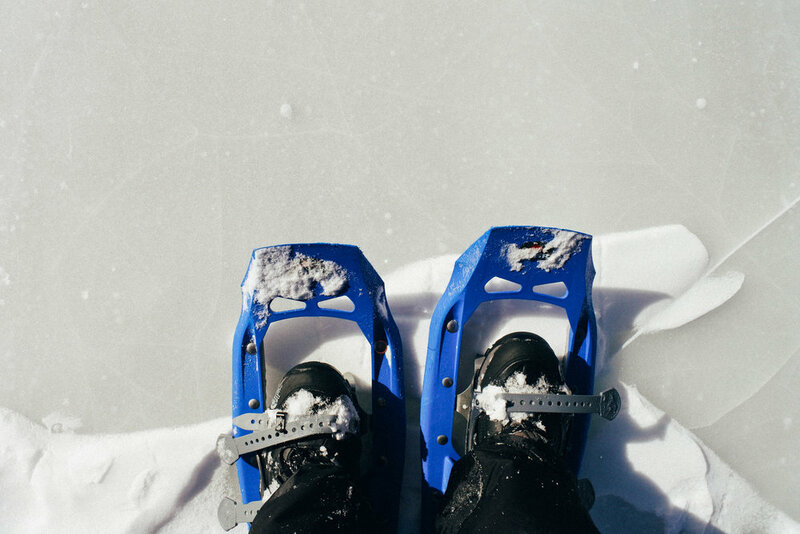 When I realized my options were taking 5 months off from adventuring every year or learning how to snowshoe (I'm not a skier, but that's a post for a different time), I chose learning how to snowshoe. The first January after we moved out here, we took a guided snowshoe hike up to Emerald Lake. We spent all day with Mike Caldwell, picking his brain about the amazing adventures he goes on, but also talking about Colorado winters and what he recommends (snowshoes among many other things). We used the Evo Snowshoes on that first trip and continued to rent them for the rest of the season. The following Christmas, we both got a pair of our own as gifts. And we love them for so many different reasons. Technical stuff first: the Evo Snowshoes utilize what's called a UniBody™ deck; it's all one piece - the steel traction rails and brake bars are molded directly into the snowshoe decks. This makes it incredibly durable and gives you a sense of security while you're out. They also have DuoFit™ bindings to make sure your boot stays attached even when you're on uneven slopes. They're easy to use, even when you're wearing your gloves, and they're freeze proof. They also make flotation tails you can add in order to carry heavier loads or for when there's lots of fresh powder on the trails. They weigh 3 pounds a pair, but I've never felt like my feet were dragging or made of lead while wearing them. They're 8 inches wide, and despite my self-professed clumsiness, I don't trip on them nearly as often as I think I should be. That UniBody™ deck is more important than you might realize. I was recently out snowshoeing with Mtn Chicks and one of the girls on the hike had her snowshoe snap in half and become unusable because of the way it was made. I'm not a coordinated snowshoer - I step on myself or try to back up and fall over, and there's not the slightest bit of damage to my Evo's. For a beginner who has a pretty tight budget, that's so important to me! If it had been my snowshoe that broke, I probably would have started crying. Not only that, but I've never had difficulty putting these snowshoes on. I have, however, watched other people struggle to figure out where their straps connect and how to tighten them because their system is much more complicated. And again, it comes down to the fact that these guys are virtually impossible to break. The place we got our guided tour from (and rented from the rest of the season) uses these pretty much exclusively. And if these bad boys can hold up to the constant use of a rental place in Estes Park? You know they've got to be durable. 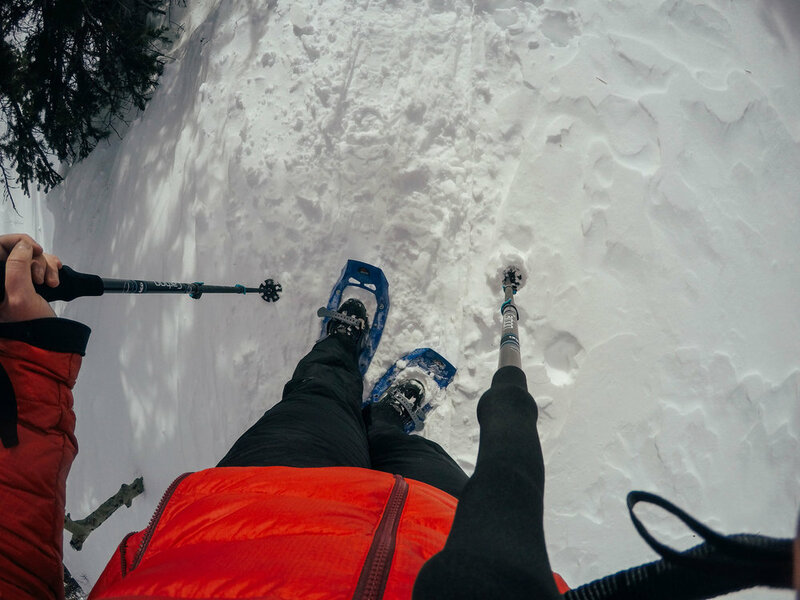 If you're in the market for a pair of snowshoes that are perfect for beginners, the Evo's are the way to go. We have been so happy with these & recommend them to anyone that asks.